Cookie Monster loves to munch on cookies while counting. Cookie Monster also loves to be tickled - press his foot repeatedly to make him giggle and move. 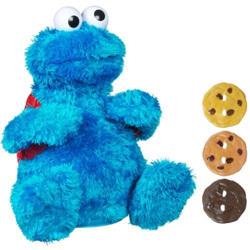 Sesame Street plush figure comes with backpack and three cookies.